Regional unrest in North Africa and the onslaught of LCC competition has taken its toll on Morocco’s national carrier, Royal Air Maroc (RAM). Job cuts and privatisation are on the table to address reported weekly losses of up to MAD20 million (EUR2 million). The carrier is also fighting back with an extensive fleet renewal programme that will see it become the first B787 operator in Africa in 2012, after last month becoming the world's first operator of ATR 72-600s. CEO Driss Benhima reported a dreary outlook of declining passenger numbers and increase operating costs, primarily fuel. He said May-2011 saw a 11% drop in passenger numbers year-on-year due to the bombing of a Marrakesh tourist café on 28-Apr-2011, as well as political tension in neighbouring countries. RAM is majority government-owned, but there have been recent reports the state is looking to partially privatise RAM, to reduce its exposure to the airline sector. Similar efforts were made in 2008 to attract an outside investor to help it address RAM's financial problems. The carrier’s management and the Moroccan government are working to attract a foreign carrier to acquire up to 30%, which is the first step towards an IPO. There have been reports that Air France-KLM, Iberia (IAG) and Emirates have been contacted, but none of the carriers have confirmed any discussions. North of Morocco in southern Europe, TAP is trying to woo Europe's big airlines to acquire it. RAM is improving its efficiency and competitiveness, partly to make it a more attractive investment. The carrier plans to take on a restructuring programme involving a voluntary redundancy plan for its employees. Of its 5,300 employees, 1,560 will be affected by the carrier’s restructuring plans, which were recently approved by its trade unions. Mr Benhima believes the restructuring will “turn around and develop the company”, which he admits has been in a “critical” position since the start of the Global Financial Crisis (GFC). RAM has even cancelled registrations for its School of National Airline Pilots 2011/2012 intake. RAM's medium- and long-term plan to boost efficiency is an extensive fleet replacement programme. The carrier has 13 B737-800s on order, five of which will be leased from GECAS with RAM to own the remaining. The outstanding aircraft will enable RAM to retire its B737-400s and -500s. RAM is the launch customer for the ATR72-600 and has ordered four, two of which were delivered in Aug-2011 with the outstanding two due in 2012. RAM also ordered four B787-8s, the first of which it expects to be delivered by Sep-2012, making it the first African carrier to operate the type and the first globally to operate the aircraft with General Electric GEnx engines. RAM has not announced plans to add any new destinations as he new aircraft will primarily be used to replace older models, such as B787s replacing B767s. 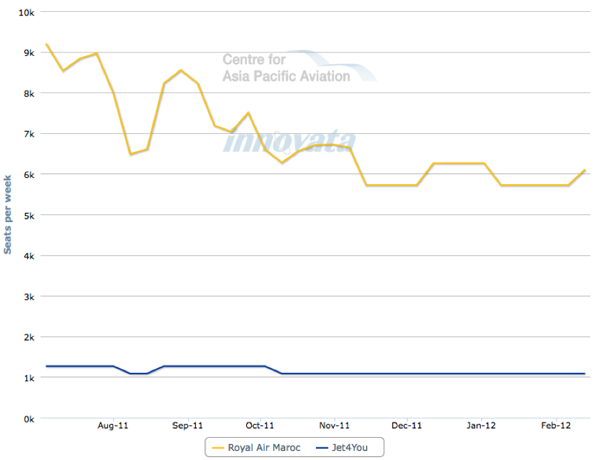 The average age of Royal Air Maroc’s in-service fleet is 9.4 years, which has been brought down significantly by its recent new deliveries, and will continue to fall in 2012. Royal Air Maroc still operates a Hawker Beechcraft King Air 200-200 (32 years old), a B737-300SF (23 years old) and a B747-400 (19 years old). RAM officially announced it will reduce its fleet size due to its problematic financial situation on 08-Aug-2011. It has not officially stated how many, or which, aircraft it plans to cut, but according to Air Journal, 11 aircraft will be put into storage. Morocco, in an attempt to boost tourist arrivals by 1 million annually, initiated a vertical Open Skies agreement with the European Union for affect in Jan-2006. Even before the deal was signed, officials were concerned about the impact of increased competition on RAM. Since 2004, more than 22 new foreign carriers have entered the Moroccan market, including 19 new European carriers and five low cost carriers. While LCCs have been causing a fundamental shift globally for over a decade, it is only in the past five years RAM has felt the affects. 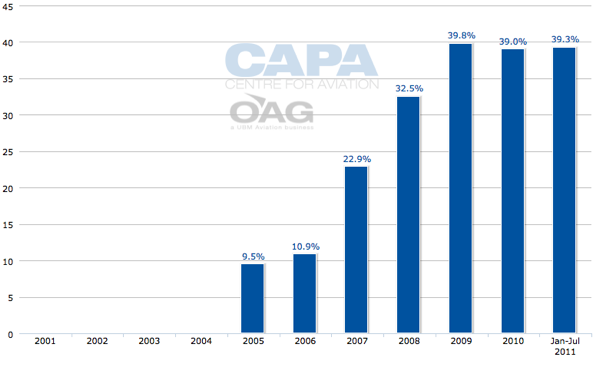 The international LCC market share in Morocco doubled in one year, increasing from 10.9% in 2006 to 22.9% in 2007. European LCCs, inlcuding Ryanair, easyJet and airberlin are now the highest source of competition for Royal Air Maroc, while cross border joint venture Air Arabia Maroc is gaining strength. LCC capacity to/from Morrocco hit an all-time high just below 40% in 2009. At RAM’s hub at Casablanca, the capacity share of LCCs is much higher than at neighbouring major airports like Algiers Houari Boumediene Airport, where LCCs account for just 0.6% of capacity and Tunis Carthage Airport (1.5%). Tunisia has this month further delayed plans for an open skies agreement with Europe, citing concerns over the competitive impact on its flag carrier and the ongoing economic problems in the region. 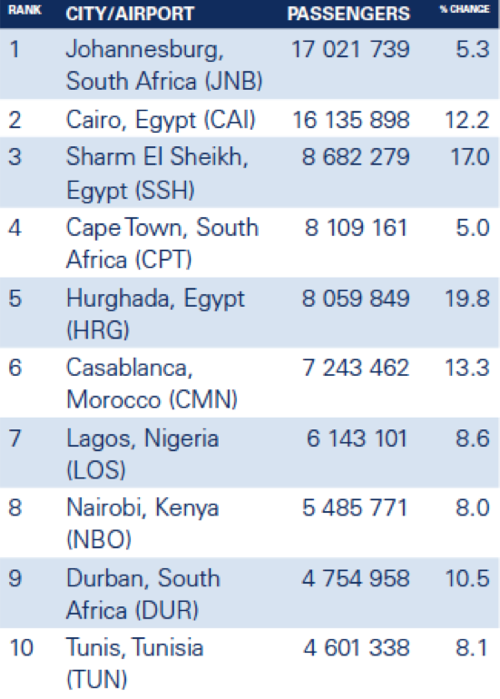 By international standards, Casablanca’s LCC capacity share is high and when compared to airports in Africa and the Middle East, it ranks as one of the highest. The capacity share of RAM's base is continually moving to a higher LCC concentration. 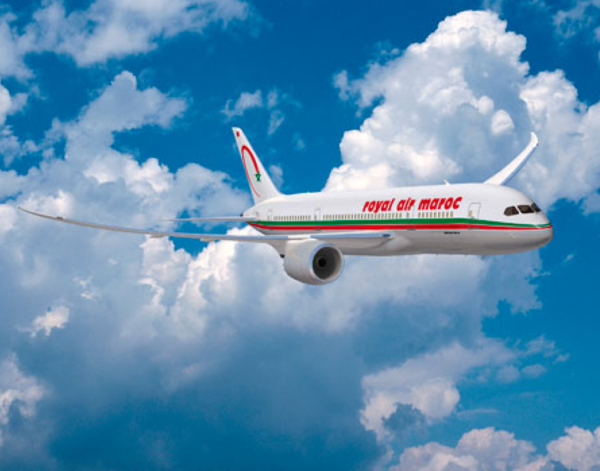 On most of Royal Air Maroc’s routes to Europe, it faces competition from LCCs such as Ryanair, Jet4you, easyJet, Air Arabia Maroc, Jetairfly, airberlin and Norwegian Air Shuttle. RAM also faces home-grown LCC competition in the form Air Arabia Maroc – a cross-border JV formed by Air Arabia and Moroccan investors in 2009 and first flew in May-2009 – as well as Jet4you, the country's first private LCC, which commenced service in Feb-2006. Jet4you is a subsidiary of TUI Travel, who has a 40% stake, and is also owned by Attijariwafa Bank (20%), Investima-SGMB (20%) and MM Marrache et Benabbes Taarji (20%). Both LCCs operate services to Europe and often compete with RAM. During 2009, RAM acquired LCC Atlas Blue and rebranded all Altas Blue services as Royal Air Maroc. All Atlas Blue aircraft were painted in RAM livery as well. RAM, unaligned to any alliance, codeshares with Brussels Airlines, Delta Air Lines, Etihad, Iberia and Turkish Airlines. Through codeshares, RAM operates services to Brussels Airport, New York John F Kennedy International Airport, Dakar Yoff Airport, Madrid Barajas Airport, Barcelona El Prat Airport, Malaga Airport, and Istanbul International Airport. The codeshare agreements allow RAM to access two of its largest trade markets: the US and the EU. RAM has not signalled its intention to join an alliance and capacity in North Africa is largely unaligned, with the only carrier in the region in a global alliance being EgyptAir, who joined Star Alliance in Jul-2008. One of RAM's potential attractions to the alliances is its position as one of the biggest airlines in Northern Africa, offering the most seats to western Europe per week for a northwest African carrier. Tunisair and Air Algerie are the carrier’s neighbouring flag carriers and both have experienced significant political unrest this year. Tunisia was the launchpad for the Arab Spring with a revolution that started in Dec-2010 that ultimately led to the resignation of the prime minister. Tunisair reported a 20% decrease in traffic between Jan-2011 and Apr-2011, with most of the fall in traffic being to/from Europe. 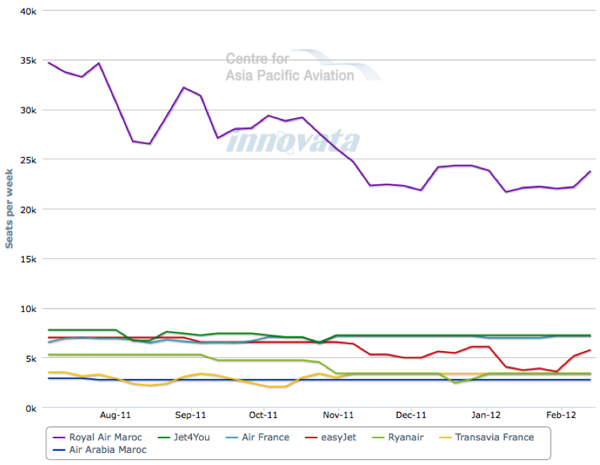 Tunisair expects traffic to pick-up again in Sep-2011. 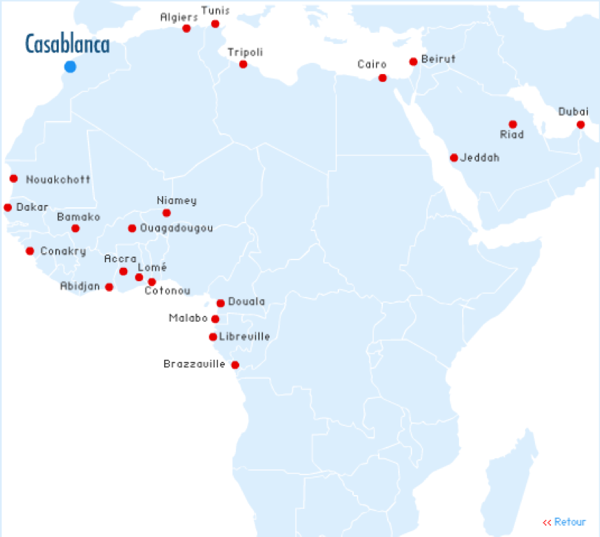 Both RAM and Tunisair’s top international route is to Paris Orly from their respective hubs. The carriers are both heavily dependent on air links to France, which Air France has reported have softened since early 2011, affecting overall passenger numbers. 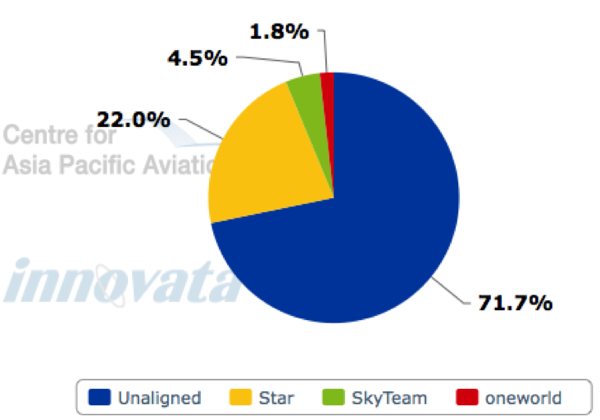 A total of seven carriers, including three Moroccan airlines and five LCCs, operate between Morocco and France, with RAM offering the most number of seats by far, according to CAPA's Country Analyser Tool. 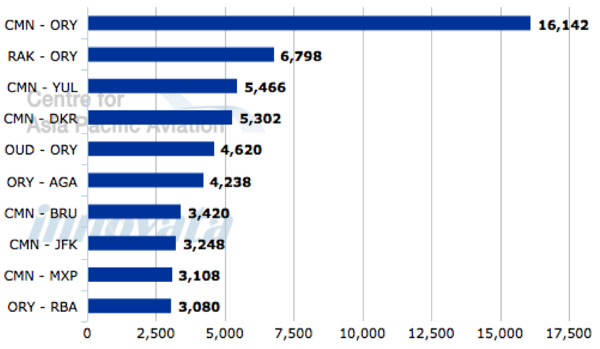 Moroccan-based LCC Jet4you offers the second highest number of seats per week, followed closely by Air France and easyJet. From Casablanca, RAM operates to Paris Orly, Marseille, Bordeaux, Lille, Lyon, Montpellier, Nantes, Nice and Toulouse in France. It competes with LCCs on all the routes except for Lille, Montpellier and Nantes. Royal Air Maroc’s top three international routes (by seats per week) all operate through Paris Orly and its top international route (by ASKs per week) is Casablanca-Paris Orly. Western Europe accounts for 126,188 of the carrier’s seats per week – over three times the amount of the carrier’s second largest region by capacity, central and western Africa. 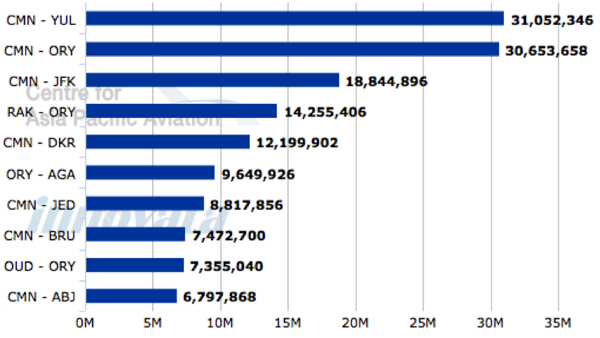 Its second biggest market, the Middle East, is thoroughly dominated by Gulf carriers. According to CAPA’s Airline Rankings Tool, Royal Air Maroc ranks 17th in terms seats per week between North Africa and the Middle East. Royal Air Maroc’s intra-Africa connectivity is limited to a handful of points in northern and western Africa, reflecting the country's top African trading partners. RAM holds a monopoly on most routes it serves in Africa. 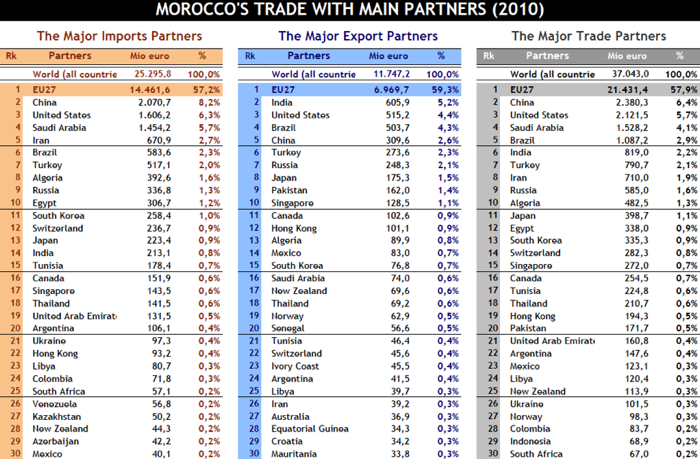 Of Morocco's top 50 trade partners, just 12 are in Africa. Algeria ranks 10th, followed by Tunisia and Libya. Served by Royal Air Maroc? The Moroccan economy’s three main “pillars” are the tourism industry, the phosphate mining industry and agriculture. 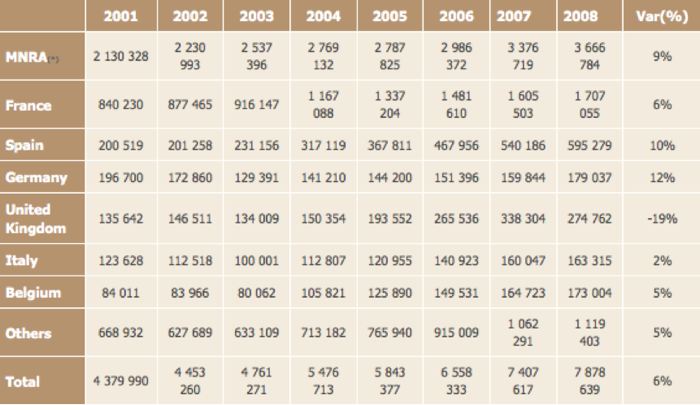 Moroccan expatriates consistently make up the largest number of arrivals to the country, followed by the French. French tourists to Morocco have been increasing, although the latest data is only for 2008, when 1.7 million French tourists visited the country. France is home to the largest diaspora of Moroccans, with an estimated 1.2 million Moroccans currently living in France. Seven of the top 10 regions with the most significant Moroccan populations are in Europe: France, Spain, Italy, Netherlands, Belgium, Germany and the UK. The European Union is by far the largest import and export partner to Morocco. Within the EU, France is the largest trade partner for Morocco. Within the EU, Morocco’s largest export partners are France (24.5%), Spain (21.2%), Italy (4.6%), and the UK (3.3%). 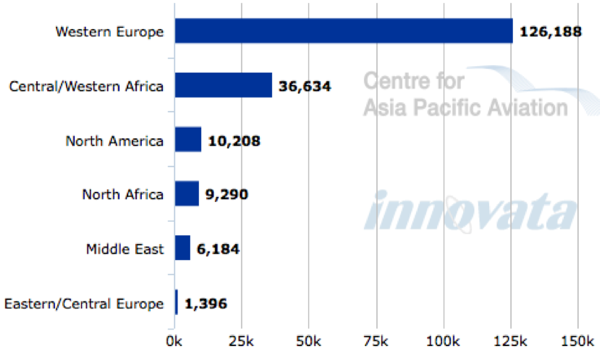 Its largest import partners are France (15.7%), Spain (12.1%) and Italy (6.5%). In import trade, France is again Morocco’s largest partner and in 2009 accounted for 15.7% of the country’s imports. The emerging markets of India, Brazil, China, Turkey and Russia represent growing markets for Moroccan exports, though only Moscow and Istanbul currently feature on RAM's network. RAM is heavily dependent on the European, and particularly French, market. The recent unrest in Arab countries has led to a considerable drop in demand and put the carrier into a loss-making state. The carrier’s hub has a high capacity of LCCs due to an open skies policy with the EU, which it struggles to compete with. Competition from LCCs will continue, and RAM needs to implement its restructuring programme and seriously consider an IPO to get itself back in the game. The carrier has largely neglected central, eastern and southern Africa in its route network, as is often the case with African carriers who concentrate on intercontinental and long-haul routes instead of regional routes where demand is low and liberalisation far and few between. RAM can build on its status as being the only carrier to serve western African countries from Morocco and few other African carriers serving the country. A possible IPO will help the carrier in the short-term but in order for it to create a successful carrier post-IPO, RAM will need to undergo major restructuring efforts and look into ways it can compete with the LCCs. Building on existing partnerships and establishing new ones will help it pull traffic where it is not able to match the prive advantage of LCCs.